Each of our bedrooms is a haven of comfort; they are all individually designed and furnished and provide every comfort you may need. On arrival you will be welcomed with a warm drink and some wonderful homemade cake! Crickhowell is perfectly placed to take advantage of the numerous activities in the vicinity - including walking, cycling, fishing, horseriding to name but a few. With the addition of great pubs and restaurants within walking distance, there is everything you need for the perfect break at anytime of the year! Lying in the beautiful Usk Valley and situated to the South of the eastern range of the Brecon Beacons, Crickhowell has been enticing visitors to this wonderful corner of Wales for many years. Historically, the town has existed at least since iron-age settlers built a fort on the top of Crug Hywel, or Table Mountain as it is now known. A famous feature of the town is the 16th century bridge spanning the River Usk - thirteen arches can be seen from one end of the bridge, but only twelve from the other side. 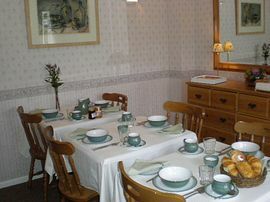 Single occupancy: £40.00 per room per night including breakfast. 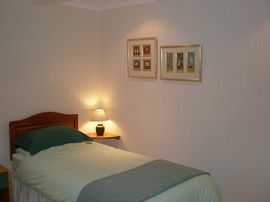 Double occupancy: £60.00 per room per night including breakfast. Check in time after 3.30pm. Check out time up to 11.00am. Pet Facilities: Pets are not allowed. By arrangement only. 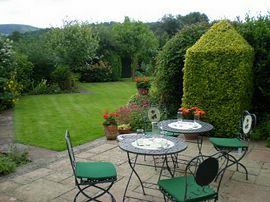 "Just brilliant, everything we could have wanted from a B&B, lovely room, excellent breakfast and very friendly and welcoming hosts. Will definitely recommend to family and friends." 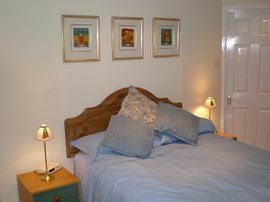 Crickhowell is conveniently sited on the A40, just six miles West of Abergavenny, and twelve miles East of Brecon. On entering Crickhowell on the A40 turn right opposite the Shell Garage into New Road. Mill Street is a sharp right turn approximately 150 yards into New Road. Gwyn Deri is situated at the bottom of the short hill on the left. Enter Crickhowell on the A40, go past the town square and turn left into New Road opposite the Shell Garage. Take the Crickhowell exit on to the A4077. 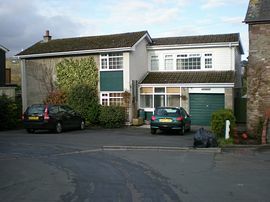 In Gilwern take a right turn signposted Crickhowell and travel for approximately 3 miles until you reach the outskirts of the town. At the traffic lights turn right over the bridge and into New Road. Mill Street is the first turning on the left. Gwyn Deri is situated at the bottom of the short hill on the left.